Olympian? We got it. Mother? Check. Pastry Chef? Yep. Meryl grew up swimming competitively in Riverside, CA and has won many championships along the way. She is no stranger to performing. She spent a year swimming in heels in Wynn Las Vegas' Le Rêve. When not in the pool Meryl loves to bake and has a pastry certificate from the French Pastry School in Chicago, IL. She now coaches full time with Raindrop Michele. Michele also grew up swimming synchro competitively, and now coaches full time with Raindrop Meryl. On the side she interns as a web developer and knits sweaters. Michele has a degree in Art History from Stanford University, which she loves to brag about. Nikki is one of our Portland natives. 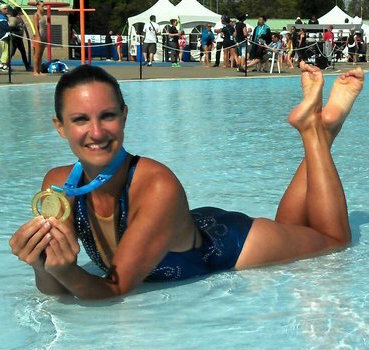 Not only did she swim growing up, but she continues to compete as a masters synchronized swimmer. Nikki has an adventurous spirit, and whenever she can get time off from her job managing a photography studio she loves to travel. Latest destination, New Zealand.